The eSignature integration is only available on Professional and Enterprise plans. It is not available on the Basic plan. More information on our plans can be found here. 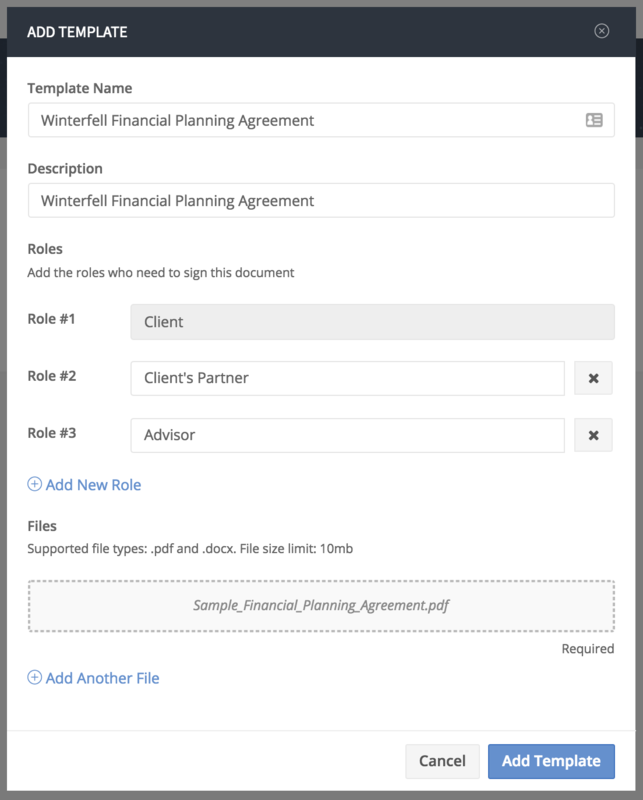 AdvicePay now offers eSignature functionality through a partnership with HelloSign to allow you to get financial planning agreements signed as part of your payment requests or independently. Easily upload your templates and become more efficient instantly! eSignature is an additional $15 per month for unlimited signatures and templates. This pricing applies to both our retail and XYPN users. The fee will be automatically applied to your next AdvicePay invoice if you enable it on your account, and it can be canceled at any time. 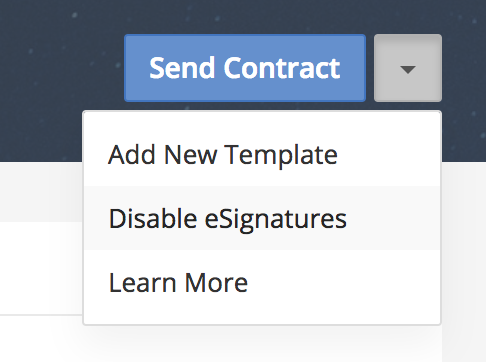 To enable: Go to Contracts and click Enable eSignature. Confirm that you want to turn on eSignatures on your account. Tip: Visit your Account Profile to view your current bill! 1. Under Contracts or Templates, click the Add New Template button. If this is your first template, a brief tutorial will appear to guide you on the key steps of the process. 2. Fill in the Template Name, Description, and (optional) + Add New Role to add additional signees if you'd like more than one person to sign the document. This is great for adding your client's partner and/or yourself as a signee on the document! 3. Drag and drop your document file into the Upload File box, or click within the box to browse + select a file from your computer folders. To add multiple documents for merging into one template, click + Add Another File. This is useful for sending a complete packet of documents to new clients along with their contract. 6. Click Continue. Your final template will now appear under Templates. Additional signees (e.g. a partner/spouse) who don't have an AdvicePay account will be able to sign the document independently of the client's account by clicking on the email link sent to them. Select the Textbox field, then drag and place it into your document template. To adjust the field size to better fit your document or to allow clients to enter lengthier inputs (e.g. email addresses), grab the corner of the field with your cursor and enlarge/reduce it. Making the box larger in height will increase the text size! To remove a field you've added, hover over it and click the ⓧ icon. Sending a document for signature can be done by sending it directly via email, or by attaching it to a payment request. 1. Add any contract template while setting up an invoice request, or from your Contracts page, click Send Contract > Send with payment request. 3. Send the invoice to the client. When your client logs in to pay, they will be guided to sign the document first. Once the document is signed, they will be able to proceed with making their payment! Tip: When a document is attached to a payment request, the invoice cannot be paid until the document is successfully signed by all signees. If you did not elect to send the invoice email to the client, additional signees will not be notified that there is a contract to sign. To notify everyone about the contract, you will want to go to Contracts and select Send Reminder for the contract that needs signatures. 1. 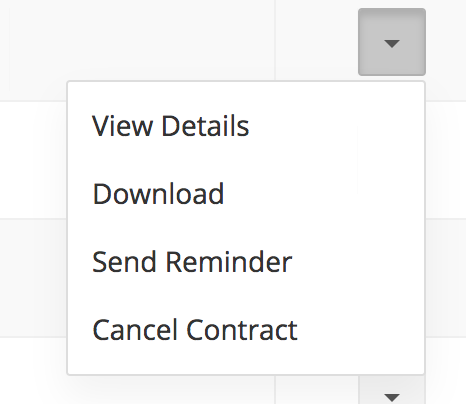 From your Contracts page, click Send Contract > Send without payment request. 2. Select the Client, Contract name, fill out the details for any additional signees, and (optional) add a custom message in the email to the signees. We will automatically pull in the name + email information for yourself and any firm users on your AdvicePay account so that you can add them as a signee. Signatures will take place within your individual accounts by visiting the Signatures page (only visible when you have contracts to sign)! If a signee does not have an AdvicePay account, select Manually Enter Details from the drop down, enter their full name, and enter their email address so that they can receive a link to sign the contract independently. Canceling a contract will update it to Voided on your end, and remove it from other signees' accounts entirely. Once a contract has been canceled, it cannot be downloaded. Tip: If you delete/cancel an invoice that has a contract attached to it, that contract will be canceled as well. This will remove the ability to attach contracts with payment requests. If you had open contracts out for signature, signing will no longer be required before a client makes a payment. If you have signed or voided contracts, they will still be viewable!